My very first snowboard, A Burton A Deck, bought back in 1997 from a small shop in Livigno, Italy, has been waiting patiently since it was retired in 2000 to be turned into something useful. It’s most recently been a posing as a shelf in our cellar but, because it's got such pretty patterns on it, I have always thought it would make a fantastic bench. 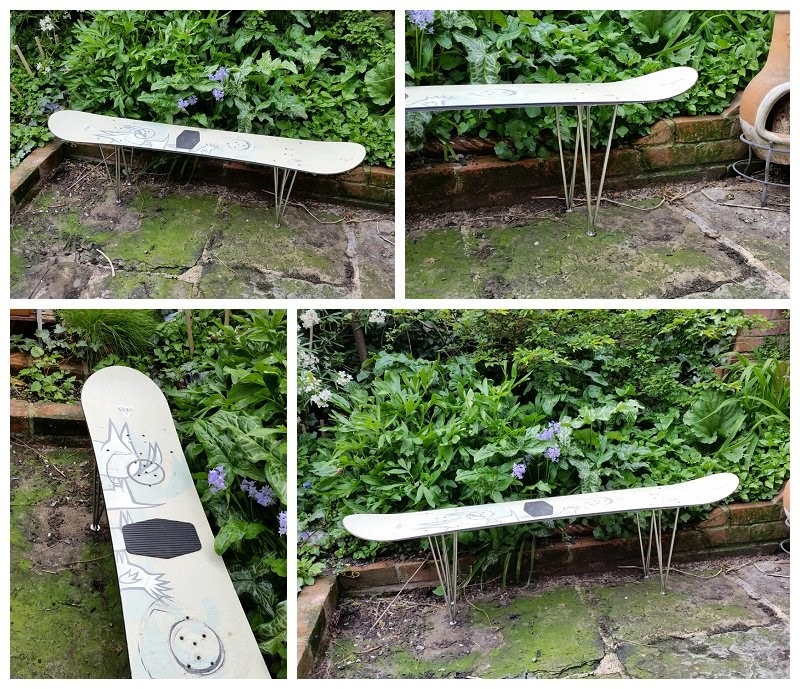 Now I realise this isn’t the most accessible of DIY projects as you might not have a spare snowboard lying about, but if you do, well, then maybe it’ll be perfect for you. 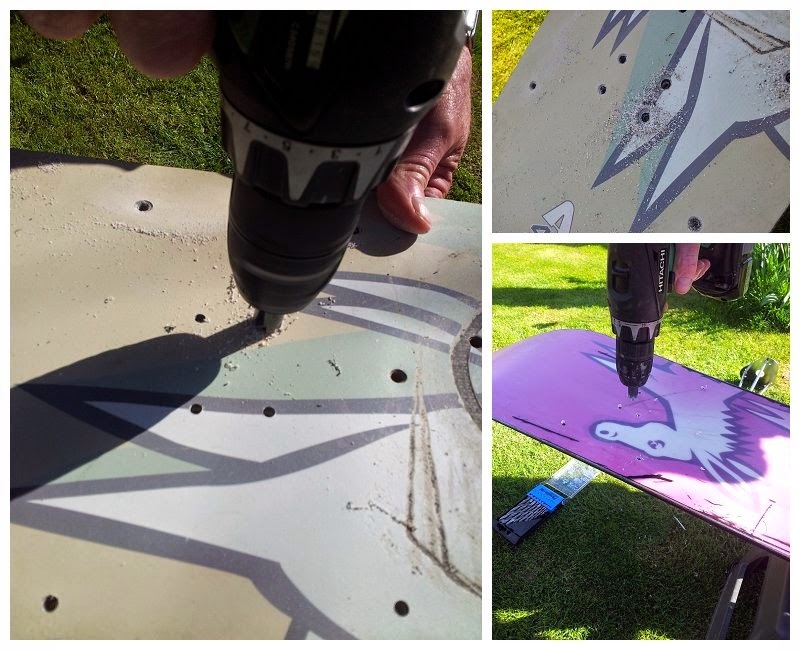 Whilst I did have a spare snowboard, I didn't have the tools that I needed to drill through said snowboard so here I had to enlist the help of my dad and his fancy smancy power tools to complete this DIY. So, on to how to make a snowboard bench. Someone to help hold things whilst you (or your dad, in my case) drills. Decide where you are positioning the legs. I wanted to use the holes left by the bindings, but my dad thought it would be a bit unstable to have them so close together, and he’s got a physics PHD so I listened to him. We positioned them equal distances from the tip and tail, and clamped the legs in place two at a time. 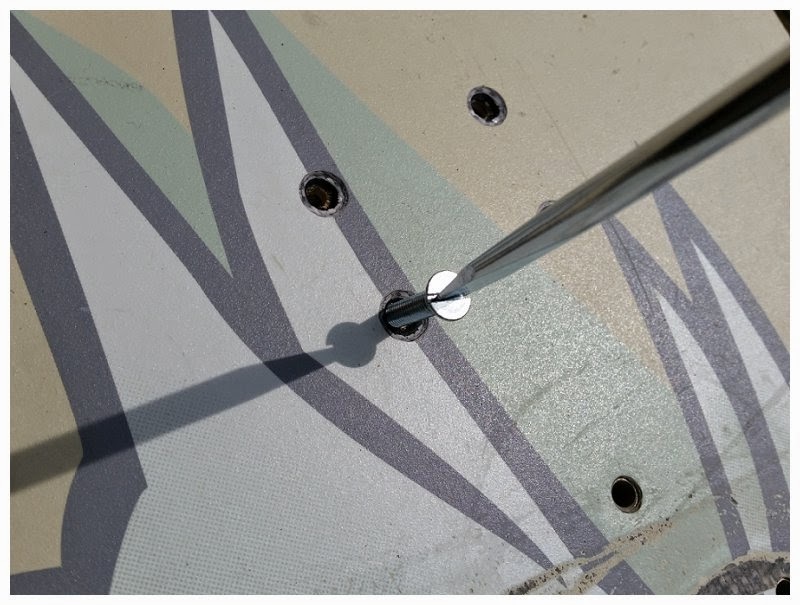 Find a drill-bit small enough to go through the holes in your legs, if like me you are using metal legs with holes. 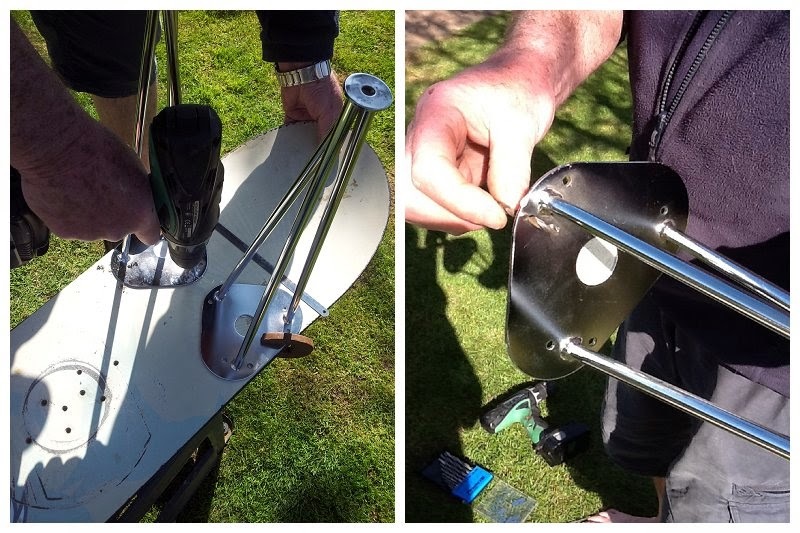 We drilled through the holes from the top down, so that any mess would be underneath the snowboard and not on show. The legs came with 6 holes in them but we only drilled 4 as 2 would have been very close to the metal edges of the snowboard. Once all the holes had been drilled we changed to the countersink bit and made little indents for the screw tops to sit in. This is where I let my dad get back to playing with Flash, as I needed to go and buy the screws to attach the legs with! Once home and with shiny screws, I set about attaching the legs to my bench properly. I really picked the easy bit to do as all it required from me was to screw the screws through the holes (it was snug fit but smaller screws would have popped right through), pop the legs on, and tighten a nut underneath. A couple of the screws had gone through at an angle so they needed a bash of the hammer to straighten them up, but it was easy! All in all it took about an hour to complete (if you ignore the fact the snowboard has been waiting 14 years to do this). 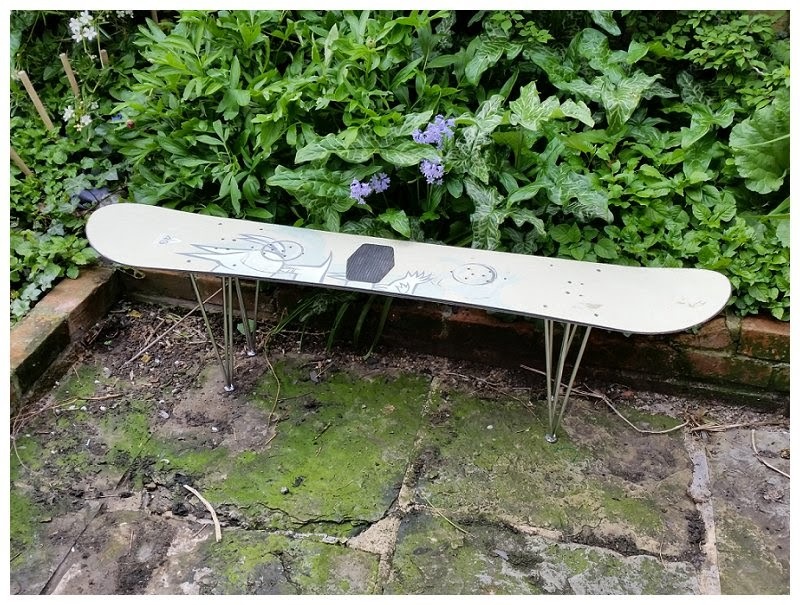 I love that we have a super cute snowboard bench in our current little yard, but I can’t wait to transport it to an actual garden. So, what do you think? 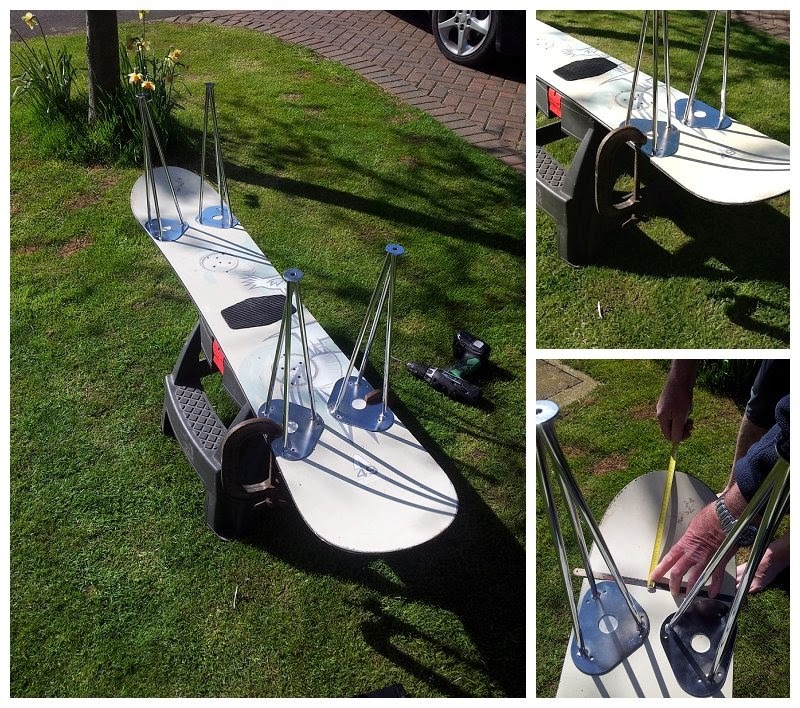 Will you be turning your spare snowboards into a bench? Or have you got some other creative way to put them to good use? Ah, I love that you don't think I'm crazy. Send your BIL's to Outspiration - It's a great little app. That is an awesome idea - I love it! Certainly not going to see many people with one of those and I guess it'll be a great talking point to! Very crafty, me likely. Thank you, and that's the hope, I can't imagine there are many of them in Sheffield either! This is such a cool thing to do with an old board. I love the legs too, I'm now having a think about what I could use in leui of a snowboard just to have an excuse to use similar ones. The legs are from B&Q, they're only about £12 each and they do a longer one too! I think a piece of beautiful wood would look ace on these legs too! I absolutely LOVE this project. LOVE, LOVE, LOVE. I like both colours too so cannot pick, sorry! Thought this might be right up your street!